Every item in our collections has to be marked or labelled with a unique identity number so it can be linked with the information we hold about it in our registry files and on the collections management database (Adlib). 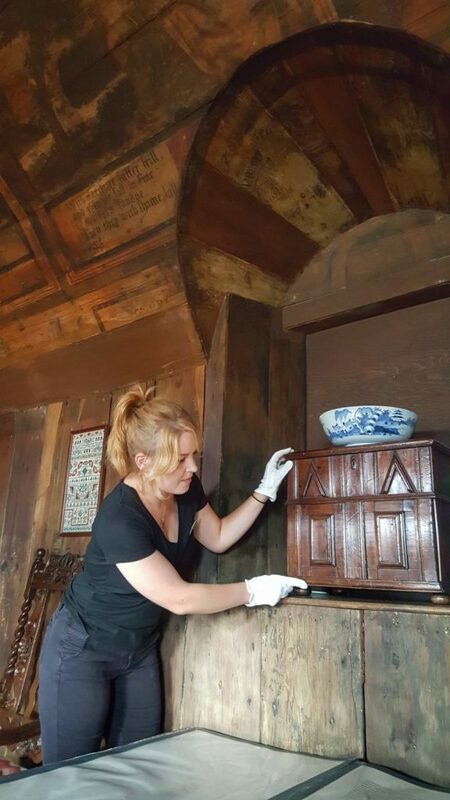 Through the work of Project Reveal and the conservation-friendly methods we have been using to label objects, we are creating and re-establishing these links between the Adlib record and the object. Many objects in our collections already have numbers marked on them, which makes our job a lot easier, but where objects don’t have a number this is where the Project Reveal teams come in. A common method for applying the number to an object is to use Paraloid B72 varnish and black or white permanent ink – known as a ‘Paraloid sandwich’. The varnish creates a barrier between the object and the permanent ink, which also means the number and varnish can be removed, if necessary, by using acetone. We have been trying out a new, removable method to apply the numbers by using acid-free paper and pre-cooked starch paste. The starch paste acts as an adhesive for the acid-free paper, which has the number either pre-printed or written onto it. This is our preferred method to number items as it is efficient, environmentally friendly and can be used on most objects. Another labelling method, specifically for textile items, is to sew a length of cotton tape, which has the unique object number written on it, into an existing seam so as not to cause more damage. 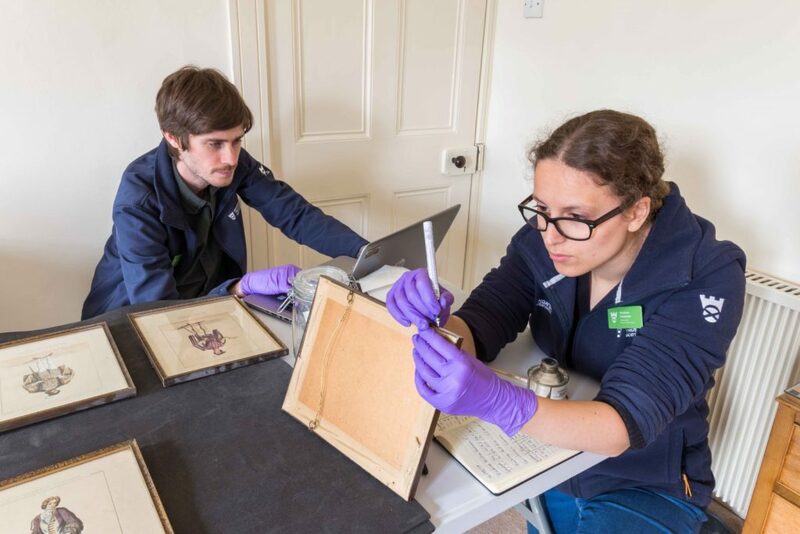 Project Reveal North East team using the Paraloid B72 method to apply the identification method to a picture frame. Objects on loan are given an acid-free tie-on label, on which we write the number using a suitable ink pen. This label can then be easily removed if the object leaves the collection or enters the collection on a permanent basis. We always try to put the number in the most inconspicuous place on the object, such as the left-hand edge of the frame for a painting, the underside of a plate or underneath the seat of a chair. For items like glass and cutlery we may use the Paraloid B72 method so the numbers aren’t so visible that they detract from the object. For bigger objects such as farming machinery we may use the same method but on a much larger scale, using paint brushes and acrylic paint to apply the number over the varnish. Carefully inspecting a collection object for its object number. Project Reveal are a safety-conscious group and we take every precaution to ensure the collections are properly handled during the marking and labelling process. This includes wearing cotton or nitrile gloves, laying Tyvek or Plastazote on tables to protect and cushion surfaces, as well as using tissue paper to provide support to the objects. Any objects we come across without a number will be marked using NTS-preferred techniques and will always be removable. With the Project Reveal inventory we’ll never be lost! Gabriella Mann, Project Reveal Administrative Assistant. Project Reveal is a multi-site digitization project of unprecedented scale. With your support, we can help the Trust manage its collections more effectively. Most important, we can help the Trust discover, better understand, and share its treasures with the world. This article was originally published by the National Trust for Scotland on November 16, 2017.